Random Views: Labour: read the writing on the wall! It’s said that one of the worst problems with having your back to the wall is that you can’t see the writing on it. Following the local elections in Britain, the writing is in letters a metre high for the Labour Party. The say, “you’ve been weighed and found wanting. You’re driving straight at a cliff edge”. Labour no longer controls a single council in Scotland, once its bastion. In terms of councillors, it has fewer even than the Conservatives. Seven years ago, the Conservatives seemed to be a spent force in Scotland; today they are resurgent. In Wales, which Labour has dominated for a century, it has lost over a fifth of its councillors and control of three councils out of the ten it had before. It was beaten to the new mayoralties in Tees Valley and the West Midlands in England, both in areas that would once have been regarded as heartlands for the Party. Overall, the pollsters and academics were seriously wrong in their forecast for Labour in England: they predicted losses of as many as 75 council seats. In the event, the Party has lost 145. Reading the writing is no good if your back is firmly to the wall. But the problem is far worse than that. A majority of Party members, representing a tiny proportion of voters as these results show, is determined to cover its eyes with virtual reality goggles. Those goggles show them a sunlit upland where voters are charmed by the honesty and integrity of the present Labour leader, Jeremy Corbyn, and impressed by his commitment to justice and decency, backing his policies in droves until they project him into Downing Street. It’s a fairy tale that many of us might like to subscribe to. But it has nothing to do with the painful reality that the local election results reveal. Labour does not win power with its traditional bedrock so completely eroded. Now this is not all down to Corbyn. The decline started under his two predecessors as leader, Gordon Brown and Ed Miliband. Both were poor leaders – Brown had been a fine Chancellor of the Exchequer, but he was far too gaffe-prone to lead the party; Miliband was simply gaffe-prone. Corbyn supporters keep pointing out to me how weak they’d been and how the rot had set in on their watch, and that’s true. However, the implication behind these criticisms is that Corbyn would turn things around. Indeed, he was uniquely qualified to do so. His political persona made him the best choice to right the ship and get it back on course. What the local election results have shown is how wrong this view was, how justified that of the people who tried to prise the leadership from Corbyn’s grip. Far from turning things around, he has made a bad situation far worse. Instead of bringing a breath of fresh air to the party, he has merely continued the decline from Brown to Miliband, making him the weakest of three weak leaders. The sad truth is that the virtual reality goggles are still firmly in place. In only one way is Corbyn an innovator: he is the first Labour leader who takes no responsibility for the disasters that happen on his watch. The poor performance is all down to the Parliamentary Labour Party that rebelled against him – although the election results only show how legitimate their aims were – or the media, or even the vile behaviour of the Conservative Party (which seems unfairly committed to the notion of what is known, technically, as “winning”). His supporters simply can’t read the writing on the wall. It will take a huge effort to get them to abandon the comfort of their nice goggles. But the attempt must be made, yet again. Interesting, just how many reminders are required that you voted him in. 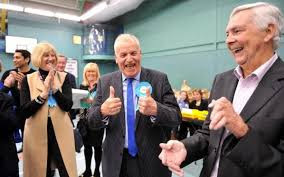 That was your best judgment and what you believe given your vision of what you believed the British public wanted and would benefit from to aid their future. Real world or dream world? I'm sorry if I failed to say this before: I was entirely mistaken to vote for Corbyn first time around. Nine months later I entirely realised my error and apologised for it. Since then I've done what I can to see him replaced.